There are rumors and leaks aplenty in Beijing as the Chinese Communist Party’s once-in-a-decade leadership hand-over draws near. The press appears to have been fed some of these stories as part of a political strategy in which rivals seek to use media from outside China to damage one another. 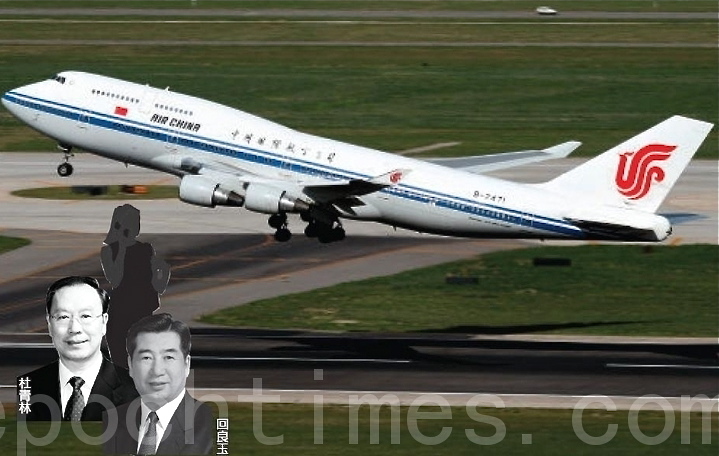 Since the mysterious return of Air China’s transpacific flight CA981 back to Beijing on Aug. 29, a series of unusual events have unfolded. On Aug. 29, Air China flight CA981 was forced to make a midair emergency turnaround to Beijing after flying seven hours from Beijing to New York. The Chinese Communist Party (CCP) mouthpiece People’s Daily said a “threat” was the cause of the change. 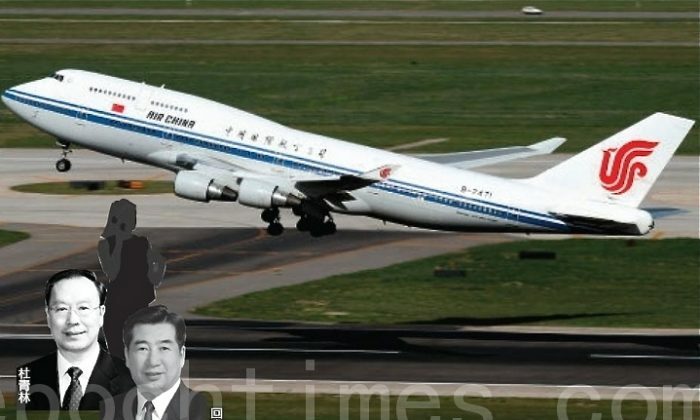 However, according to a report by aboluowang.com, a Chinese-language news website based outside China, a female spy named Ms. Ding, who works for the United Front Work Department, was arrested after the flight returned. Ding was said to be in charge of intelligence in Taiwan and secret communications between Chinese Vice Premier Hui Liangyu and Du Qinglin, the former Director of the United Front Department, which, among other tasks, helps serve as a cover organization for China’s vast worldwide intelligence network. The report stated that Du is an ally of former Party leader Jiang Zemin and that he was one of the key leaders in the coup plan masterminded by domestic security czar Zhou Yongkang and Bo Xilai, the disgraced former Party head of Chongqing. Vice Premier Hui Liangyu was also involved in the coup plan, the report said. On Sept. 1, the CCP made two major personnel changes in one day, a highly unusual occurrence. Du Qinglin, who is also the Vice Chairman of Chinese People’s Political Consultative Conference, suddenly “retired” from his post as director of United Front. Du was replaced by Ling Jihua, Hu Jintao’s trusted aide. And Li Zhanshu, a stalwart of Hu’s Communist Youth League faction and said to be close to the presumptive next CCP head Xi Jinping, succeeded Ling as the Director of the CCP’s General Office. The next day, Hong Kong’s South China Morning Post published a negative investigative report on Ling Jihua. Soon afterwards, the New York Times and Los Angeles Times also filed negative reports on Ling. Radio France International (RFI) commented that it is unusual that several media were reporting about Ling Jihua, since sensitive news like this is usually hard to verify or confirm in China, because of the tight information control. Meanwhile, Zhou Yongkang, the controversial domestic security chief, who was said to be under “internal control” for the past several months, also appeared in the media. The Chinese regime’s mouthpiece Xinhua News Agency reported on Sept. 5 that during his visit to Anhui Province on Sept. 3 and 4, Zhou “inspected” the Intermediate People’s Court in Hefei, where Gu Kailai had been on trial. On the same day, Xi Jinping disappeared. Xi canceled his meeting with U.S. Secretary of State Hillary Clinton because of a “back injury,” according to the Wall Street Journal. He also cancelled meetings with the prime minister of Singapore and with a Russian official. Xi also did not attend an emergency meeting on the Yunnan earthquake on Sept. 8, held by the Central Military Commission of which he is the Vice Chairman. On Sept. 10, Xi missed another meeting with Danish Prime Minister Helle Thorning-Schmidt. In addition, He Guoqiang, the head of the Central Commission for Discipline Inspection and a Politburo Standing Committee member, has also disappeared from the public for over a week. Boxun, a Chinese-language website outside China, reported that Xi and He were injured in two separate road accidents on Sept. 4. However, the article was later removed from Boxun’s website. Reuters reported on Sept. 7, that Xi had during the past six weeks met with Hu Deping, a prominent reformer and member of the Chinese People’s Political Consultative Conference. During their conversation Xi had mentioned that he was not an ally of Bo Xilai. Zhang Xinyu, founder of the Global Information Freedom Movement commented that many of these reports are political speculations. “Most Chinese media have lost credibility among the public,” Zhang said, so the CCP has turned to exploiting the freedom of speech outside China in order to deceive the Chinese public. “Somehow, if something is not produced in China, people can more or less trust its authenticity,” Zhang told New Tang Dynasty Television. An article by RFI said the unprecedented frequency and effect of providing negative information about certain political rivals to selected global media, especially mainstream English media, has made it not only a public relations tool, but a strategy to attack rivals in the political struggle before the 18th National Congress.